Big fins and big horsepower numbers continued in 1958. 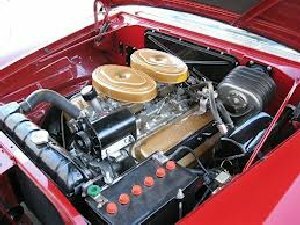 The standard engine in the 300D was upgraded to the 392 Hemi� V8 which featured 10.0:1 compression, new valve timing, heavier pistons, and a new camshaft resulting in 380 bhp. The very rare electronic fuel-injection option increased horsepower to 390. This $400 EFI system (the first use of a computer in a Chrysler� product) proved trouble-prone and most of the 35 fuel-injected cars were recalled to install the standard dual carburetors. Exterior changes were minimal with a simpler eggcrate grille up front and odd, truncated taillights that no longer filled the space for them in the tail fins featured on the rear. The 300D was a large car with two-door hardtops weighing in at 4,305 pounds and convertibles grossing 4.475 pounds. Power brakes came standard. Performance remained world class. A 300D, driven by Norm Thatcher at Utah's Bonneville Salt Flats, achieved a new Class E speed record of 156.387 mph. Another was driven by Brewster Shaw at the Daytona beaches, producing a quarter-mile time of 16 seconds with a trap speed of 94 mph. Despite this performance, only 618 hardtops and 191 convertibles were produced. This would be the last year for the Chrysler Hemi engines for a while. 300D SERIES - (8-CYL) - This super high-performance car was again a sub-series of the New Yorker. It carried forward the design motifs of 1957 with only minor alterations. The windshield on hardtops now conformed to the windshield style (domed) of the convertible. 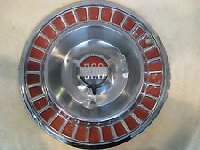 Hub caps now had red finish, painted in the depressed outer areas of the wheel covers. 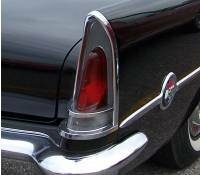 Instrument face backgrounds were identical to those of other 1958 Chryslers. Large red-white-blue rear quarter panel medallions returned for the second year, but the letter 'D' replaced the 'C' used in 1957. In all, there were ten locations for the various size 300 medallions on the car: glove box, grille, deck lid, steering hub, hub caps and the aforementioned rear quarters. 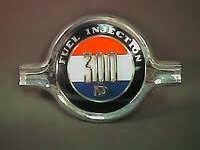 A limited number of 30OD's were built with an electronic fuel injection system called the Bendix Electrojector. This marked the first use of a computer in a Chrysler product. A recall program was instituted, in late summer 1958, and most of the EFI units were replaced by conventional carburetors, although of the dual four-barrel configuration that was standard on all 300's. It was also the last year for the 'Firepower' hemi-engine. 300D SERIES - (8-CYL) - This super high-performance car was again a sub-series of the New Yorker. It carried forward the design motifs of 1957 with only minor alterations. The windshield on hardtops now conformed to the windshield style (domed) of the convertible. Hub caps now had red finish, painted in the depressed outer areas of the wheel covers. 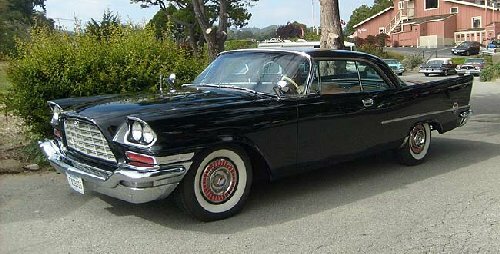 Instrument face backgrounds were identical to those of other 1958 Chryslers. Large red-white-blue rear quarter panel medallions returned for the second year, but the letter 'D' replaced the 'C' used in 1957. In all, there were ten locations for the various size 300 medallions on the car: glove box, grille, deck lid, steering hub, hub caps and the aforementioned rear quarters. A limited number of 30OD's were built with an electronic fuel injection system called the Bendix Electrojector. This marked the first use of a computer in a Chrysler product. A recall program was instituted, in late summer 1958, and most of the EFI units were replaced by conventional carburetors, although of the dual four-barrel configuration that was standard on all 300's. It was also the last year for the 'Firepower' hemi-engine. 300D SERIES I.D. NUMBERS: Serial numbers and motor numbers were in the same locations as on previous models. All 300's were built in Detroit and serial numbers began with LC4-1001 and up. Engine numbers started at 58N3--IOOI and up. Torsion-Aire front suspension, sway bar and Oilflow shock absorbers standard on all models. 300D used larger diameter torsion bars. New Yorker and 300D	9.00 x 14. Safety rim wheels standard all models. CONVENIENCE OPTIONS: 1958 300D Options: Power steering on Windsor, Torqueflite on Windsor, Power brakes, Power windows, Power seat, Air-Temp air-conditioning, White side wall rayon tires (Nylon tubeless super soft cushion tires in black and white optional), Stainless wheel covers on Windsor, Remote control mirror, Radios, Antennas including power antenna, Two-tone finish, Tinted glass, Heaters, Rear window defroster, Windshield washer, Undercoating, Non-slip differential, Hi-Fi Phonograph, Auto-Pilot.